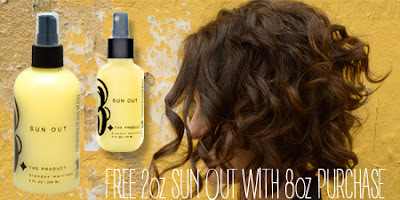 Get the 2oz Sun Out free with the 8oz purchase. Get the 2oz Sun Out free with the 8oz purchase. The Sun Out will protect your hair color from harsh UV rays that will fade those beautiful tones into a brassy mess! The Sun Out also works as a leave in conditioner and blow dry spray. $10 value, free with 8oz Sun Out purchase.